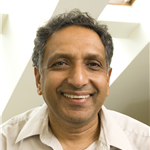 Professor Vanka is working in a number of areas related to computational fluid dynamics. These include transport processes in chemical vapor deposition (CVD) reactors, large eddy simulations in continuous casting of steel, microscale mixing, particle transport in turbulent flows and heat transfer in wavy passages. His most recent contributions have been in CVD flow and transport processes. He investigated a geometry and parameter set that gives uniform deposition of the thin film on large diameter wafers-a process that may be of importance to the microelectronics industry.